The model MG-1 pressure sensor has been developed for the measurement of pressure with medical gases and for oxygen applications. Only materials that are suitable for oxygen applications are used. In order to ensure the required level of cleanliness,any contamination of the components during production is avoided. The model MG-1 is manufactured under controlled conditions, then it is marked for use in oxygen applications and packed with special care. In line with international directives, different levels of cleanliness, different packaging and different instrument markings are available. 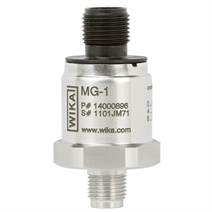 The MG-1 pressure sensor offers a solution which is optimised for your application.